You'll see the results of that nightly processing on the stock scan results pages, on each stock's page and on certain other pages, like the bottom of the recent IPOs page and the industry and sector pages (e.g. here's the semiconductor industry page and the healthcare sector page). 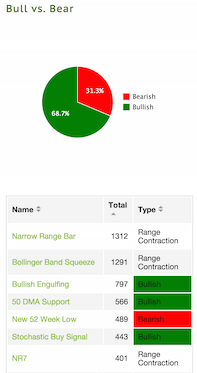 The technical analysis scan results also appear on what I consider to be the most important pages of the site -- each user's portfolio and watchlist pages. It's on these pages where you can quickly get a feel for how your stocks stocks are acting technically. 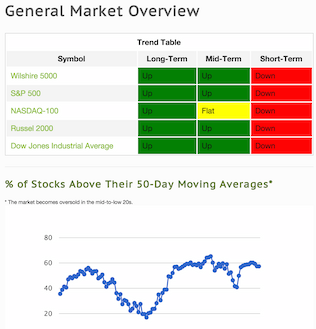 I created the General Market Overview page to help me get a quick read on the major indices. At the top of that page is a trend table, which shows how each index is faring with respect to its 10 (short-term), 50 (intermediate-term) and 200-day (long-term) moving averages. A quick glance at how much red or green is in that table gives me a good idea of the market's health and whether I should be looking for longs or shorts. Under the the trend table is a graph of the percentage of stocks above their 50-day moving averages. I like to use that indicator during selloffs to tell me when the market's getting really oversold. (I don't like this indicator quite as much as Worden's T2108 but it's a decent proxy for T2108.) Once that indicator dips below 25 I take that as a sign the market's getting stretched too far to the downside and begin to take appropriate action depending on how I'm positioned at that time. Lower on that page are sections which summarize the most active stocks as well as the "hottest" signals for the day. In order to hunt for new trade opportunities I'll check certain stock scan results. Depending on how the broad market is positioned and acting I'll focus more on bearish or bullish technical patterns. I usually find it useful to see what types of technical events occurred most on a given day, so I'll sort the scan results table by the 'total' column. Looking at those numbers gives me some insight into how the market is acting. I get a very different feeling if I see 900 stocks broke below their 50-day moving averages vs a day when we get 1,000 stochastic buy signals. Also note that there are two tabs on that page -- one tab which lists all the scans and one tab which breaks them out by category. From there I'll click through to any interesting stocks to see their detailed technical analysis page and stock charts. (I'll usually command-click on a Mac or CTRL-click on Windows to open the stock pages in new tabs on my browser.) If I like what I see on a stock's page I'll add it to my watchlist by clicking the add to watchlist button. The watchlist and portfolio pages are what I check most on the site. The watchlist page lets me see for each stock its percentage change since being added to the list as well as the day's percentage change. I'll often sort the list by those columns to get a quick feel for how those stocks have been performing and to see which ones I need to trim. Below the list of stocks with their performance numbers is a list of recent technical signals for the stocks in the watchlist. I make sure to check this section daily to see any technical developments that inspire me to initiate a trade. As I wrote in an earlier blog post, this feature is the key reason I created the site. If I'm really pressed for time I can simply look at this section of the watchlist page to see if there are setups I need to take. One of my biggest problems in the past was missing setups and this feature has helped me tremendously in catching setups on stocks that I've been stalking. At the bottom of that page is recent news for stocks in the watchlist. I check the stops section of that page in order to manage my stop loss orders in my brokerage account. Any stops that have been violated get highlighted in red. I plan to add some more functionality around stop management in the future. So that's how I'm currently using the site. My watchlist and portfolio contain stocks that I either own or that I'm stalking. In either case, I want to be alerted to technical patterns / events that those stocks make. 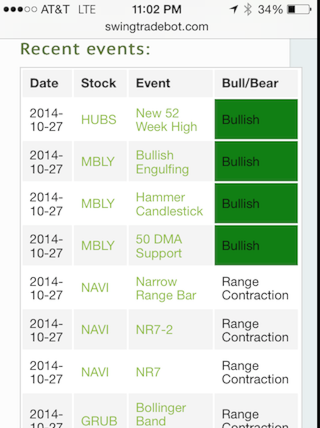 The site tracks the stocks for me and allows me to easily view the technical alerts. I use the nightly scan results to search for stocks making technical patterns that I like to trade. When I find a candidate I add it to my watchlist. So how are you using the site? What features / functionality would you like to see added? You can leave a comment below or email me at swingtradebot - at - gmail - dot - com.